Spectrum Dance Theater opened this year’s “Byrd at 10” season October 25, 2012, with a re-staging of director Donald Byrd’s powerful 2008 work The Theater of Needless Talents. The program notes emphatically state that the work is not “about” the Holocaust, but is instead a “response” to the atrocity, delving specifically into the creative lives of artists imprisoned in concentration camps and ghettos. The work is both a testament to the creativity that was lost, (especially the music by Jewish Czech Erwin Schuloff who perished in the Holocaust), and also a profound contemplation of how artists were able to continue creating and performing in the face of such horror. The live music, which always lends a piece more depth, deserves further mention. Schuloff was an extraordinary talent and the three musicians (pianist Judith Cohen, violinist James Garlick, and cellist Rajan Krishnaswami) do him great justice. Schuloff’s varied compositions shade the many moods of the piece, ranging from haunting and elegiac, to bluesy and mischievous. 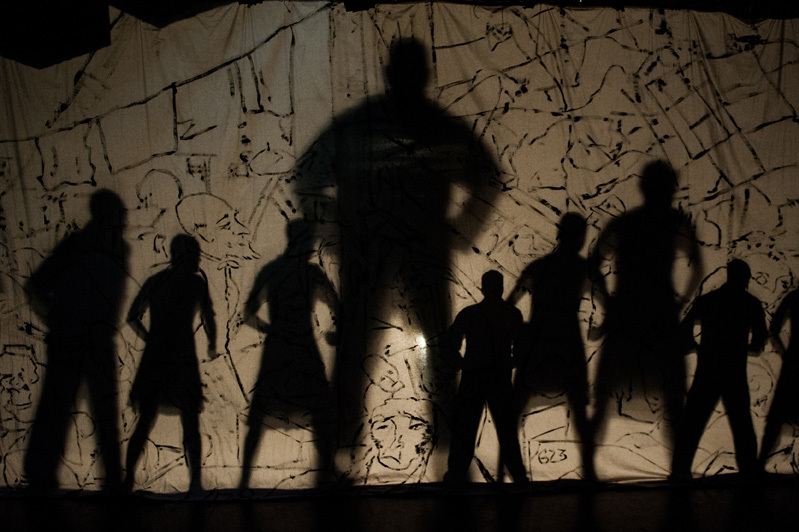 “Remembering,” the first section, began when the curtain, a chaotic mural of sketched faces and bodies by Jack Mehler, was drawn back. The dancers, standing in rows and clad in 1940s clothing, moved robotically, an underlying violence in their gestures as they pounded their fists against their hip bones and swayed rigidly from side to side. Amidst their heavy footsteps, they shout Holocaust statistics. The numbers are horrifying and all encompassing, citing not just Jewish victims but the thousands of political protestors, handicapped, homosexual, and other opposition groups from all over Europe that were persecuted. 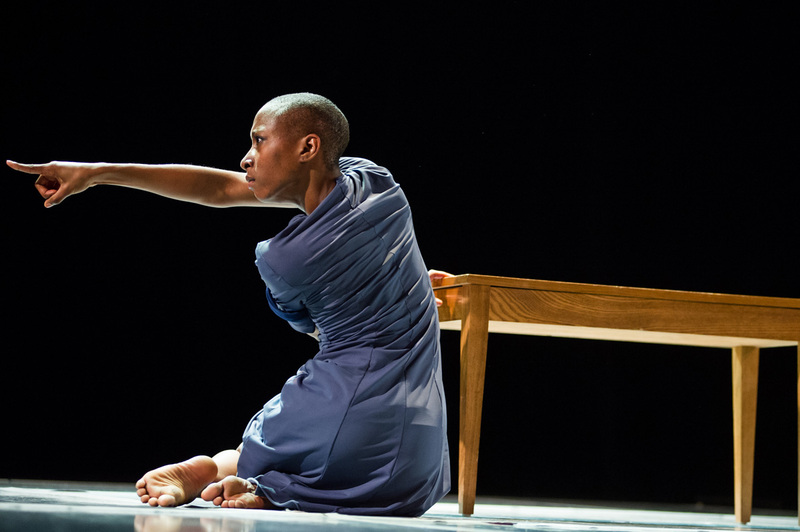 “Remembering” recalls the massive scope of the Holocaust, but also presents intimate personal stories, a stunning and grief-filled duet by Kate Monthy and Donald Jones Jr., and a tortured, convulsing solo by Vincent Michael Lopez. The second section, “In the Camps,” shifted the focus to the actual act of performance in concentration camps and ghettos. Dancers take turns performing for each other in solos and small groups, and recited stories from the camps give further context to these performances. They alternate between crazed vaudeville numbers with plastered-on smiles to languorous depictions of hopeless melancholy. The juxtaposition of the two is jarring, but captures the impossibility of the situation the artists faced. Art became an act of hope, of defiance, a reminder to those held captive that they were still human, and a means of escape from their bleak reality. Many powerful images result, like Cara-May Marcus dragging underneath Alex Crozier-Jackson, her arms around his neck as if their relationship were just another cross to bear. None are more evocative however, than a harrowing solo by the willowy Jade Solomon Curtis. She points a trembling finger accusingly at the audience, implicating everyone in her suffering, before turning her hand into a gun at her temple. The movement vocabulary is filled with nuance, but the work loses a bit of momentum here, as the “performances” seem to re-iterate themselves. The work ends on a powerful and haunting note; the “Epilogue” provides the strongest statement of the work, Byrd’s reminder that tragedies like the Holocaust continue to this day. The dancers return to the phrase from the first section, this time reciting statistics of recent genocide and persecution in Darfur, Somalia, Vietnam, and others. As the curtain closes, their shadows continue moving, looming large but anonymous. It seems to extol that it is not just the known people who suffer, but the faceless, the other and the many, that we are too often unaware of. In terms of the performance as a whole, the talented Spectrum dancers are known for their incredible precision, and Needless Talents is no exception. Their technique is sharpened to a razor’s edge; Byrd’s choreography both demands and showcases their remarkable flexibility and control. And, as it is often performed at a fever-pitch of intensity, there’s no room for complacency. This requires an extreme amount of effort, and the dancers consistently deliver it, but, especially in Spectrum’s intimate studio theater, this effort becomes overly palpable. The dancing never looks entirely labored, but it never feels quite comfortable to do, or to watch either. Every shape is stretched to its energetic maximum, and ease is rarely utilized. A specifically cultivated aesthetic, this can be very impressive, but often assaults the viewer with its force. This may be exactly the point; Byrd pushes the audience out of complacency as well, engaging the viewer with aggressive presentation. A hugely important work, Needless Talents examines the Holocaust through a unique lens. It compels the audience to remember the atrocities that were, and also to confront the reality of the ones that still exist. More than anything, it portrays the human spirit, its resiliency and perseverance, and the role art plays in this resolve. Ultimately, though the Holocaust silenced many talents, even in the most dire of situations they were never needless, but all the more essential. Though there were only four nights of performance here in Seattle, the company is in the midst of a national tour. They recently performed in Indiana, Texas, and New Hampshire, and will continue with stops in Tennessee and Oklahoma. Furthermore, Donald Byrd will be discussing Needless Talentsand the Jewish themes in his work on November 4, at the Stroum Jewish Community Center. For more information on this event click here.